We have previously discussed how marijuana can be used to relieve stress but since I have found that this topic goes beyond the everyday stress… there is a darker side to it, called anxiety and depression. In this article, I explored how marijuana can help you or anyone manage their anxiety and depression, adding value back in one’s daily life. Being nervous and anxious in situations like speaking in public or being in an unfamiliar place is something many of us feel occasionally. To relieve this kind of stress, we normally need time to relax or remove oneself from the situation. There are, however, people who feel extreme anxiety constantly which can lead to depression, and this kind of stress level requires more advanced treatment. Extreme anxiety and depression are common disorders for people who have either experienced an undesirable or traumatic event but it can also be unclear on how a person developed it with no significant event to blame. It can be very challenging to deal with and it’s important to seek treatment to manage it. There are various methods and prescription medications patients can take, but it is with recent discoveries where a new treatment has been revealed. The groundbreaking research proves that marijuana can help manage anxiety and depression. And by the looks of it, it may be the treatment of choice in the near future. Before we explore the healing properties of marijuana for anxiety disorder and depression, let’s take a moment to learn what a person deals with when they suffer from extreme anxiety and depression. Anxiety disorders are the high and low feelings of stress that build up in one’s daily life routine, which eventually can wear a person out and may lead to depression. People with heightened anxiety usually suffer great amounts of stress when making big decisions in their daily life. Anxiety can give you a feeling of uneasiness, makes you worrisome and nervous toward events with uncertain outcomes. It can be triggered by simple events such as watching your favorite sports team lose a game on television. Most of us usually shrug off the term “depression”, as a serious mental health condition because we tend to “misuse” the term in mundane circumstances. Why should we take depression seriously? Heavy or major state of depression is called Clinical Depression. It is when a person tends to experience recurring extreme anxiety which eventually affects one’s ability to perform daily responsibilities. When a person suffers from Clinical Depression, the value of life decreases and everything tends to lose significance. Anxiety and depression can be treated similarly since both disorders usually compliment each other. Cognitive Behavioral Therapy is one way to go about combating anxiety and depression. CBT is a form of guided treatment, a process of taking step by step actions involving facing and overcoming one’s fear as a pathway to recovery. Marijuana is a natural option for treating anxiety and depression. It also has fewer side effects than those of the pharmaceutical option. It is less addictive than pharmaceutical drugs and is considered a natural remedy with no adverse effects. Of course, it is very important to remember, like any substance or medication, everyone has a different reaction to chemicals so Marijuana may not be the right treatment for you. Many studies show evidence that the cannabidiol (CBD) in cannabis can significantly help manage anxiety. The process of how it impacts the human body is scientific but I have tried to explain it simply below for anyone to understand. The CBD molecule in Cannabis actually works well with the Amygdala, an area of the brain, which is responsible for emotional learning and stress levels. By consuming Marijuana, the CBD component can regulate the levels of emotional stress by targeting specific neurons that produce chemicals responsible for feelings of anxiousness, fear, and paranoia. A study in Brazil in 2011 tested marijuana on a group of patients with social anxiety disorder and the results showed “CBD was associated significantly to decrease subjective anxiety”. Finally, another study released in 2014 found how the central amygdala and endocannabinoid system impact one another when it comes to stress. It’s hard to ignore the fact that marijuana can help reduce or manage the symptoms of anxiety and depression by giving the patient a feeling of relaxation and euphoria. Medical marijuana used to treat these symptoms are not necessarily the same as consuming any marijuana. Medical Marijuana research has come a long way and people can now access different strains of marijuana for different purposes. For anxiety, medical marijuana with high levels of CBD and low THC (the hallucinogenic component) targets specific areas of the brain that are responsible for stress responses and emotional learning without sending a patient on a “trip”. Those strains with high THC (tetrahydrocannabinol) levels are more prominent in giving out the paranoia experience, but what most people don’t know is that many strains in the medical marijuana industry have little to no THC content at all. There are strains with High-CBD and Low-THC levels that anxiety sufferers can take advantage of. In fact, CBD (cannabidiol) may even have more medicinal properties than of THC, although both properties go hand in hand with each other. In a recent study that highlights the effect of CBD in the brain, it was found that exogenous cannabinoids could regulate stress responses and emotional learning. 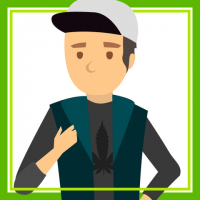 By recognizing a person’s tolerance level and sensitivity towards cannabis and by picking the right strain that can relieve them of the symptoms of Anxiety and Depression, marijuana can naturally work for anyone and can serve as a pathway to recovery. This is an Indica dominant strain that relaxes the mind rather than supercharging it. Patients usually experience relief in stress and tension in the body and mind. Although it’s a high THC strain, Jack Herer gives out a euphoric feeling that’s calming and soothing. This is also another Indica dominant strain that has high levels of CBD. A hybrid that also has high levels of myrcene, it is what most people with anxiety disorders prefer. The euphoric properties of marijuana can provide relief for patients who suffer from Anxiety Disorder and Depression and can aid them in their recovery. Besides the restricted access to medical cannabis in most countries and states, there is also a lack of specific cannabis strains that can effectively treat the illness. With the legalization of cannabis still an ongoing battle, the problems of proper and lawful distribution is also an issue. Hopefully, the truth about cannabis and its healing properties will become globally realized, so that it can be more accessible to patients who want to opt for marijuana in managing their anxiety and depression. Would you prefer Cannabis over pharmaceutical drugs as a treatment for Anxiety and Depression? Share your opinion in the comment section below!